Not only Homo sapiens made engravings. 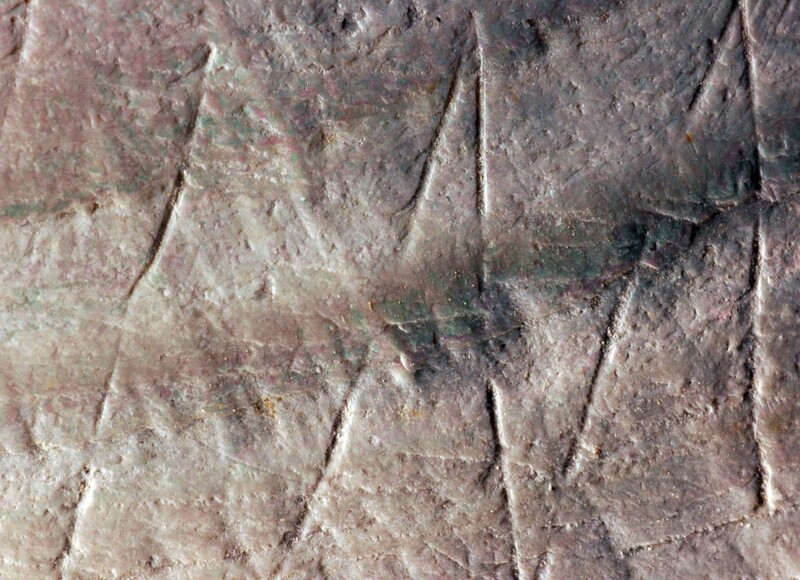 “Until this discovery, it was assumed that comparable engravings were only made by modern humans (Homo sapiens) in Africa, starting about 100,000 years ago,” says lead author José Joordens, a researcher at the Faculty of Archaeology at Leiden University. Detail of the engraving on fossil Pseudodon shell (DUB1006-fL) from Trinil (credit: Wim Lustenhouwer, VU University Amsterdam). A team comprising of 21 researchers studied hundreds of fossil shells and associated finds and sediments from the Homo erectus site in Trinil, on the Indonesian island of Java. The shells are part of the Dubois Collection that has resided at the Naturalis Biodiversity Centre since the end of the 19th century. The Dutch physician and researcher Eugène Dubois excavated the shells, and also discovered the Pithecanthropus erectus – known today as Homo erectus. Inside of the fossil Pseudodon shell (DUB7923-bL) showing that the hole made by Homo erectus is exactly at the spot where the adductor muscle is attached to the shell (credit: Henk Caspers, Naturalis, Leiden, The Netherlands). The discovery of an engraved geometrical pattern on one of the shells was a brilliant surprise. The zig zag pattern, that can only be seen with oblique lighting, is clearly older than the weathering processes on the shell arising from fossilisation. The study has eliminated the possibility that the pattern could have been caused by animals or by natural weathering processes and shows that the ‘zigzag’ pattern is the work of Homo erectus. By applying two dating methods, researchers at the VU University Amsterdam and Wageningen University have affirmed that the shell with the engraving is between 430,000 and 540,000 years old. This means that the engraving is at least four times older than the previously oldest known engravings, which were discovered in Africa. Purpose or meaning of the engraving? This research has demonstrated that these early human-like people were very clever about how they opened these large freshwater mussels; they drilled a hole through the shell using a sharp object, potentially a shark’s tooth, exactly at the point where the mussel is attached that keeps the shell closed. “The precision with which these early humans worked indicates great dexterity and detailed knowledge of mollusc anatomy,” says Frank Wesselingh, a researcher and expert on fossil shells at Naturalis. The molluscs were eaten and the empty shells were used to create tools, such as knives. The discovery from the historical Dubois collection unveils unexpected new information on the skills and behaviour of Homo erectus, and shows us that Asia is a promising and, so far, relatively unexplored area for finding intriguing artefacts. From the Netherlands, researchers at Leiden University, the Naturalis Biodiversity Centre, the Vrije Universiteit Amsterdam, the universities of Wageningen and Delft and the Cultural Heritage Agency of the Netherlands were involved in the research. The research is being financed by research funding from the NWO Spinoza Prize. 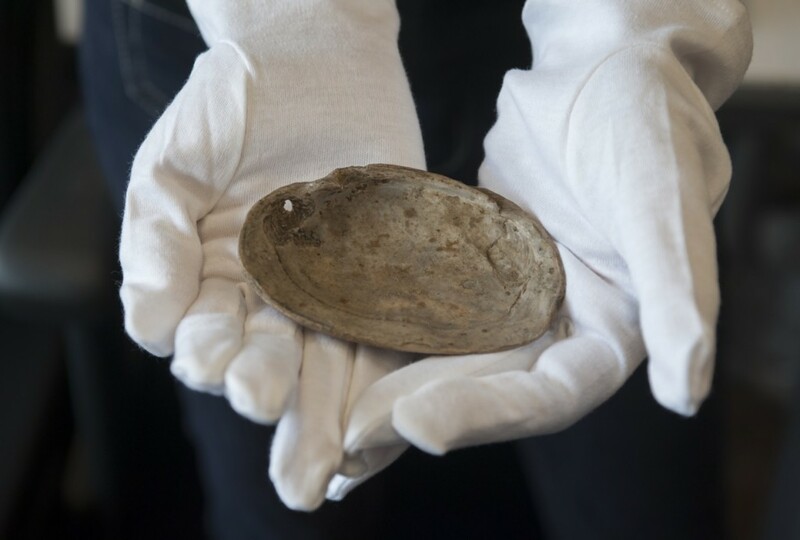 The shell with the oldest known human engraving will be on display in the Naturalis museum from the 4th December.